Home News How could Attenborough get it so wrong about the walruses? How could Attenborough get it so wrong about the walruses? THIS month the new Netflix series Our Planet, narrated by David Attenborough, was launched with great fanfare. One segment made headlines around the world, showcasing hundreds of walruses falling off a 260ft cliff to their deaths. They do so out of desperation not choice. Every square inch is occupied, climbing over the tightly packed bodies is the only way across the crowd – those beneath can get crushed to death. In a desperate bid to avoid the crush they try to head towards the cliffs. But walruses’ eyesight out of the water is poor, but they can sense the others down below, as they get hungry they need to return to the sea. In their desperation to do so, hundreds fall from heights they should never have scaled. Zoologist Dr Susan Crockford suspected that the event was actually a well-publicised incident in the autumn of 2017, at Ryrkaypiy in north-east Russia, when a group of polar bears drove several hundred walruses over the cliffs to their deaths, before feasting on the corpses. A couple of days later, Andrew Montford was able positively to identify Ryrkaypiy as the location in the Our Planet film.The Netflix producers denied seeing any polar bears, but this does not alter the fact that many bears were in the area at that time. Indeed, to get their aerial shots, there must have been some sort of helicopter or drone flying immediately above the walrus, which seems to me to be an utterly irresponsible thing to do. Regardless of the exact cause of the stampede, why were the walrus at Ryrkaypiy in the first place? Is it the case that they were forced to go ashore because their sea ice had melted? The distribution of Pacific walruses varies markedly with the seasons. Almost the entire population occupies the pack ice in the Bering Sea in the winter months. Through the winter they generally congregate in three areas, immediately southwest of St Lawrence Island, south of Nunivak Island, and in the Gulf of Anadyr in Russia. As the Bering Sea pack ice begins to break up and melt in spring walruses begin to move northward and their distribution becomes less clumped. 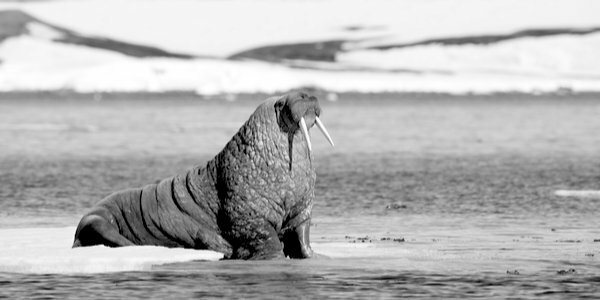 By late April walruses can be found from Bristol Bay northward to the Bering Strait. During the summer months, as the pack ice continues to recede northward, most of the population migrates into the Chukchi Sea. The largest concentrations are found near the coasts between 70 N latitude and Pt Barrow in the east, and between the Bering Strait and Wrangel Island in the west. Concentrations, mainly of males, are also found on and near terrestrial haulouts in the Bering Sea in Bristol Bay and the northern Gulf of Anadyr throughout the summer. In October the pack ice begins to develop in the Chukchi Sea, and large herds begin to move southward. Many come ashore on haulouts on the Russian side of the Bering Strait region. Depending on ice conditions, those haulout sites continue to be occupied through November and into December, but with the continuing development of ice, most walruses move south of St Lawrence Island and the Chukchi Peninsula by early to mid-December. Whereas the males head south, the females and juveniles follow the sea ice north, as it recedes in spring, eventually going as far as Wrangel Island and Point Barrow. Crucially, as the ice begins to grow back in October, these large herds move ahead of it back south, often coming ashore at places such as Ryrkaypiy on the Russian coast (No 51 on the map above). As the map indicates, such hauling out is commonplace and widespread along that stretch of coastline (green dots). Remember that the Ryrkaypiy incident occurred in the autumn of 2017. The earlier the sea ice re-forms, the earlier the walrus arrive on Ryrkaypiy. This is the total opposite of Attenborough’s version, that they are there because of a lack of sea ice. How he can get such a basic fact wrong is beyond my comprehension. Given all this mayhem and loss of sea ice, you might think that walrus were an endangered species. But you would be wrong. According to the FWS, a survey in 1975 estimated the size of the Pacific walrus population at 221,360. There was a dip in numbers in the 1980s and 90s when hunting restrictions were relaxed, but a preliminary estimate for 2014, using improved methodology, was about 283,000 individuals, with a confidence interval of 93,000-479,000. Pacific walrus population size has varied substantially in the last 150 years, it increased between 1960 and 1980 and may have reached the carrying capacity of the marine environment. What we do know is that the FWS found after a comprehensive review in 2017 that the Pacific walrus does not require protection as threatened or endangered under the Endangered Species Act. Is it to further his own political agenda? Or has he merely followed the script given to him by the WWF? We don’t expect to hear the truth from the WWF. But if Netflix don’t quickly correct and retract this particular segment of the series, it will be highly damaging for their own credibility at a time when they are just embarking on producing serious documentaries. A longer version of this article was first published in Not a Lot of People Know That on April 14, 2019, and is republished by kind permission.